We get a ton of requests for advice from small and medium-sized business owners who are in the process of revamping their existing websites. We know that Spartan Spark’s lead generating websites aren’t a fit for every business, so for our lovely entrepreneurs, we’ve compiled a list of resources you should know about before you start building that new website. 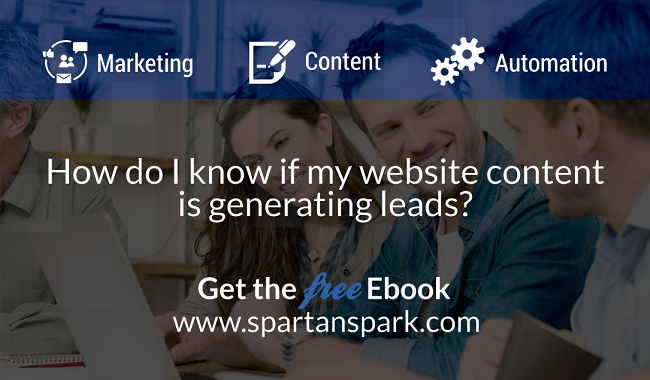 Spartan Spark has been working with professionals in these areas for the past 10 years and based on that knowledge we’ve come up with our SEO and marketing automation software to create a powerful and automated lead generating system. Most medium-sized business owners are still forced to hire all these experts individually or through an agency or contractor, which is often extremely expensive. But before you bring this team together, as a business owner you’ll want to know the key elements that go into creating a lead generating website. For the medium-sized business owner who is going to invest in storefront banners, stand up banners, graphics for their website, graphics for social media, etc., we highly recommend finding a brand strategist to work with. If you choose not to go for a brand strategist, here are a few ways you can find the right “look” for your company. This might seem counter intuitive but after helping hundreds of business owners over the last 10 years with their online marketing, we know this method actually works! Your first step will be to nail down a graphic concept for your brand. Get a professional graphic designer to draft some mock ups of a website for you. When you’re thinking about a graphic concept you want to think in terms of the emotion that people get when they do business with you. You’ll want to relay that concept throughout your website, social media, branding materials, and your overall online presence to create a consistent brand. To give you some inspiration, here are some examples of how big name brands set up their style guides. Your website should have 4 rotating banners. These are your primary calls-to-action. Next, you want 3 smaller boxes that are your secondary calls-to-action. Your secondary calls-to-action are in batches of 3, which is important because statistics show that most people will become overwhelmed if you have more than 3 options to choose from. This is where your user experience expert would be helpful, they can guide you to get your website set up in a way that engages your visitors and keeps them there, which will also help your SEO ranking because your bounce rate will be lower. Now that you have a “look” for your website, you’ll want to work on a logo that matches the rest of your look. The reason you want to work on your design first is that we’ve seen companies (who didn’t hire a brand strategist) get a logo and then by the time they’re finished with their website and social media design, those critical brand pieces end up looking disjointed, costing hundreds and sometimes thousands of dollars to re-do one or the other. When you’re choosing a name for your website, think of your target audience. What would they be Googling to search for what you do. It's even better for both your SEO and your target market if you can have an industry or location term in your name. If Douglas wants to index for "Calgary, Alberta" he might want to make his page name KirkInsuranceCalgary.com, because what happens is when someone searches "insurance calgary", his domain name looks like a really good fit to the search engines. Does your name pass the phone test? Another really important concept is to make sure your domain name passes the “phone” test. You should be able to tell people your domain name over the phone without having to spell it out. Remember that your email will also have the same domain name so you want to make it as easy as possible for your customers and prospects to find you. Using Douglas Kirk the insurance guy again, if he were to name his website dkinsurance.com he'd always have to explain that it's "d" like Douglas and "k" like Kirk, which is not easy for people to remember or to say over the phone. Business owners often don’t realize that when they create a new website, they lose all their online credibility with the search engines if they don’t transfer it over in a technical way. The longer your website has been on the internet, the more credibility you have with the search engines. So changing to a new domain name can negatively affect you if you don’t do it correctly. As a high level explanation, when the search engines index your website, they consider each page on your website as if it was its own individual website. So each page is transferring credibility to the other pages on the website. Think of all the links about your website that are spread all over the internet. For example if anyone referenced your website through social media, or mentioned you in some blog post, or if you’ve registered yourself on yelp, etc., those links might point to individual pages on your website, which you might not be keeping. Instead of letting those links die and your search engine reputation with it, you can transfer that online credibility. If you just turn your old website “off” and turn a new one on, then all those links are broken and you’re not passing any link-points over to your new website. Why didn’t my web designer tell me about this? You might be wondering why no one told you about this before. Often your web designer won’t even mention these things because she or he is most likely not a search engine optimization expert. (I’m sure you’re beginning to see why you might need access to all these different kinds of experts). Now that you know a little about how this works, you can ask your web designer to make sure they’re passing your link points through 301-redirects. Moz SEO Redirection is a resource you can share with your web designer. It explains a little more about the process of these re-directions, and is one of the most trusted SEO resources on the internet. You’ll want to ask your web designer to make sure your website is as fast as possible. Google puts a lot of weight on the speed of websites, especially because it affects mobile searches. When you’re vetting web-designers, ask them to send you references of websites they’ve created and test them for speed. Get your web developer to sign a contract with you saying that the job is not done until you’ve achieved over 90% in Google’s speed test. Once your website is up, you should test it to make sure you’re getting the results you need. Even though we’ve talked about blogs in the 7 Critical Elements Every Home Page Must Have page, we can’t stress enough how important they are to to both your website’s ranking and your business' credibility. Show people that your website is updated regularly. Showcase your information, not anybody else's information - if you're trying to establish credibility, don't allow guest posts on your website, do the leg-work yourself to make sure your visitors can see that these are your thoughts and ideas. Always post your original articles about things that you know. Blogs show what makes you the expert in your industry. "Sign Up to My Newsletter” just doesn't work anymore. No one wants to sign up to yet another newsletter. Instead, get your website visitors to opt into something valuable that you have to offer. Create an incentive for people to join your email list. This is where the professional marketing strategist comes in handy. They’ll know what words are best to use for titles and subtitles to create enticing calls-to-action. If you want to do the research yourself, what you can do is search online for the top 100 headlines, or you can browse through one of our favourite marketing guru's, Jay Abrahams The 100 Greatest Headlines Ever Written. Now that you have a way for people to sign up, you need to create a checklist or ebook that’ll show off your expertise. If you’re using the do-it-yourself approach, what you can do is download several ebooks on topics that you’re interested in and try to emulate the layout. Don’t forget to set up some kind of follow-up system for staying in touch with your leads and so you can keep sending them valuable information until they’re ready to buy. Your editorial calendar is the heartbeat of your lead-generating website . You’ll want to create a schedule for your blogs and your social media interactions. The information you share should be 80 percent knowledge-sharing and 20 percent sales. 80 percent of your social media posts should be knowledge-sharing content that links back to your website. All of your blogs should also be posted to the largest social media outlets with a unique abstract or summary on each one (Google hates duplicate content). You should also have a system in place to email your blogs once a month in the form of a newsletter, because your visitors will soon forget about you if you don’t remind them how resourceful and valuable you are to their lives. This is definitely not the end of the list, there are so many more details to creating an online marketing funnel out of your website. We’ve spent over a decade discovering them all, adding our SEO algorithm to them and putting them into our Spartan One software program for medium-sized businesses. This list, however, should set you on your way to a much more productive online experience and will give you a much better chance of using your website as an asset. Call us at 1-844-460-5077 for a complimentary assessment.